Sakai Community DocumentationSakai 19 User Guide (English) Sign-UpHow do I modify Sign-Up tool permissions? The set of permissions applies to the use of the Sign-up Tool across the site, not to any particular meeting. Permissions can be granted, by role, with an interface for doing so that resembles that of other tools. 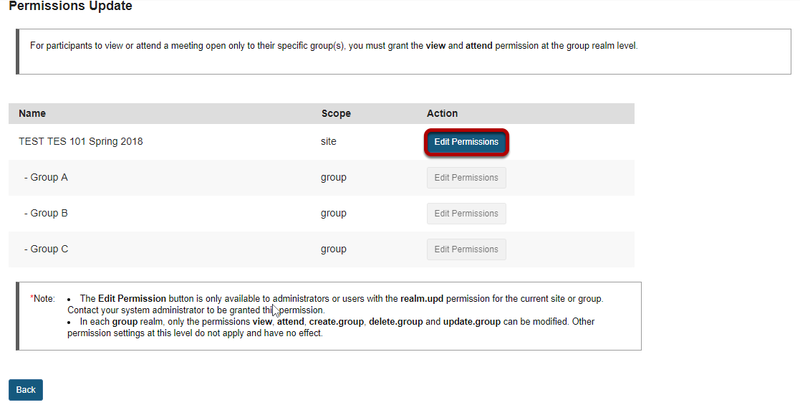 The “Permissions” link shows, for each realm of grouping— (1) site (all members), and (2, 3, ...) group, for each group defined on that site, a labeled button that leads to an authorization matrix. For groups that do not include the site organizer as a member, the group button is not active in the Permissions settings and the site organizer cannot adjust the settings.